Viewers installed throughout downtown Long Beach gives visitors a glimpse into the city's past. As part of their Placemaking Challenge, the Downtown Long Beach Alliance (DLBA) has provided a grant to fund a project by We Are the Next, a Long Beach-based nonprofit, entitled “Step Back.” Each year the DLBA grants tens of thousands of dollars in grants to citizens wanting to improve their community with the Placemaking Challenge. 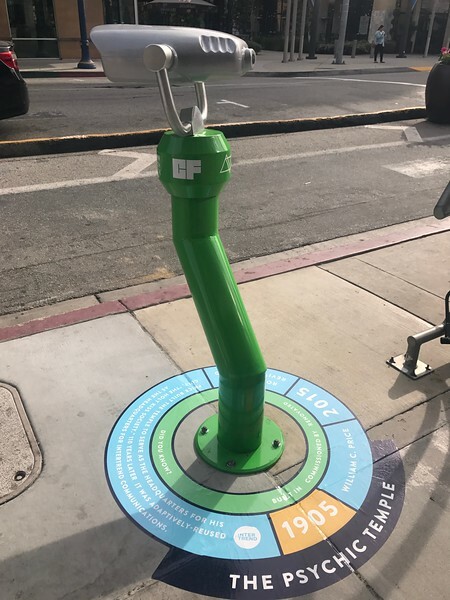 This immersive experience includes three locations throughout Downtown Long Beach, and was installed last week. 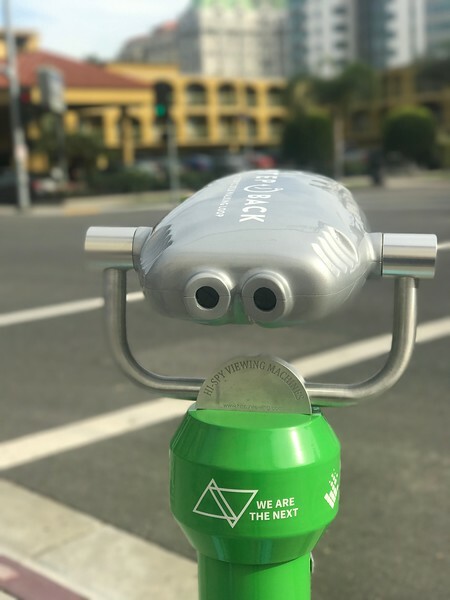 Step Back is the brainchild of Katie Rispoli Keaotamai, Executive Director of We Are the Next and allows passersby to look into the bright green viewers and see what their exact location looked like at a different point in time. The locations of the viewers were chosen based on pedestrian traffic, availability of a historic photograph, and recent construction near the installation. All photographs center around a building that has been renovated but remains recognizable compared to its original appearance: the Travelodge, the Psychic Temple, and the Public Safety Building. In addition, each photograph includes a building that has been demolished, preserved, or constructed recently. Rispoli Keaotamai partnered with CityFabrick, a non-profit design studio dedicated to transforming communities, to design a walking loop and infographics positioned beneath the viewers to share details of the subject building at each location. The walking loop will take pedestrians and eager historians on a 2.18 course to check out all three viewers throughout Downtown. At the first Step Back viewer, located at First Street and Atlantic Boulevard, users will see a 1970s view of the Travelodge with the iconic Villa Riviera and other residential high rises in the background. This motel stood as an example of commercial Mid-Century Modern design until it was renovated in 1999. Then, at Broadway and Promenade, right in front of Congregation Ale House, viewers will see the Psychic Temple building as it looked the 1960s with the now-renovated Edison Building behind it. interTrend Communications, who sponsored this Step Back location, reused this unique building as offices in 2015, which was originally built as the headquarters for a local cult and was later converted into a hotel. Finally, passersby can look through the viewer at Broadway and Magnolia, in front of the Deukmejian Courthouse, to see the Long Beach Safety and County Buildings under construction in the 1950s. We Are the Next will be reposting photos that are posted to social media with the hashtag #StepBackLB, and that anyone who spots a Step Back viewer in the wild should proudly share their pictures, use the hashtag, and tag @next_nonprofit. 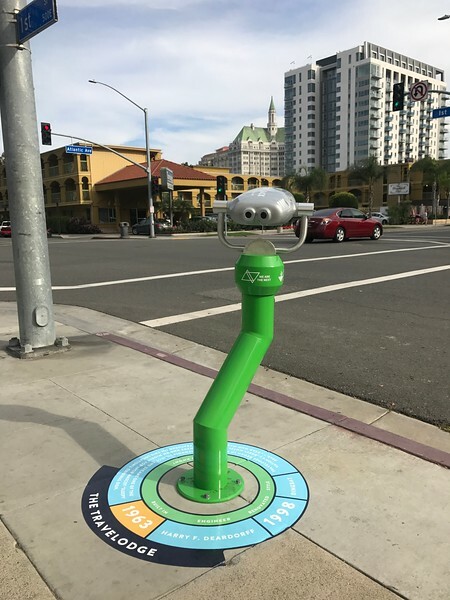 About DLBA: The Downtown Long Beach Alliance is a non-profit organization operating on behalf of the stakeholders of the Downtown Business Improvement Districts. It is dedicated to cultivating, preserving and promoting a healthy, safe and prosperous Downtown. For additional information, visit www.downtownlongbeach.org.